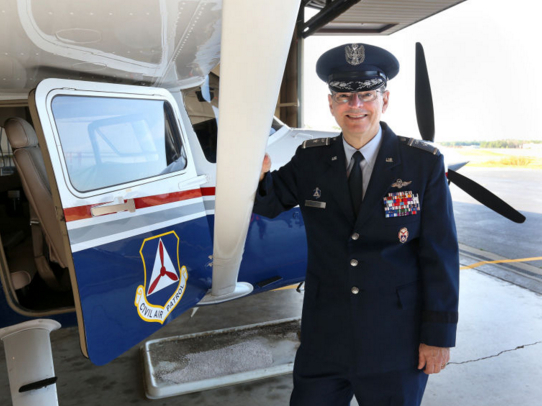 A Henrico man has been sworn in as the new national commander and CEO of the Civil Air Patrol. CAP Maj Gen Joseph R. Vazquez of Henrico was sworn in Aug 15 at the organization’s 2014 national conference. “It will be my privilege to lead the team of national staff, wing and region commanders who make CAP simply the best nonprofit corporation in the country today,” said Vazquez, minutes after taking the guide on as national commander. Vazquez, who previously served as national vice commander for three years, succeeds CAP Maj Gen Chuck Carr. Brig Gen Larry Myrick of San Luis Obispo, CA, a past commander of CAP’s Pacific Region, was sworn in as national vice commander. As CAP’s 23rd national commander, Vazquez will lead 60,000 volunteers across the nation in fulfilling the organization’s three congressionally chartered missions – emergency services, cadet programs and aerospace education. The national commander presides over the CAP Command Council. He is the first national commander chosen by the Board of Governors, the organization’s governing body, in CAP’s 72-year history. The new selection process became official in October 2012 when the board approved an updated constitution and bylaws incorporating the organization’s new governance structure. Previously, commanders were elected by a majority vote of the organization’s National Board, a predecessor of the Command Council. Vazquez joined CAP as a Georgia Wing cadet in 1975. During nearly four decades of service, he has served as commander at every level, including service as Middle East Region commander from 2008-2011. He also commanded the Virginia Wing from 2001-2003, the Virginia Wing’s Group 4 from 1993-1995 and the Maryland Wing’s Wicomico Composite Squadron from 1990-1992. He was cadet commander of Georgia Wing’s Warner Robins Composite Squadron from 1976-1978. A CAP command pilot with more than 3,500 flying hours, Vazquez is a single and multi-engine commercial pilot and also a Federal Aviation Administration commercial-rated glider instructor pilot. Before his brief remarks Friday, Vazquez introduced three members of his command staff – Executive Officer Col Larry Ragland, Inspector General Col Tom Kettell and Chief of Legal Corps Maj Gen Dwight Wheless. Be the first to comment on "BoG Appoints General Vazquez as National Commander"